Crafted from oak with a wide base to let aromas expand and lined with honey wax to help bring out flavor. You could drink your whiskey out of a red plastic cup. But that's like going to a kitten cafe just for the coffee. Sometimes it's all about the experience, and this oak tumbler has been thoughtfully designed to enhance all of whiskey's complex goodness. Each is crafted from one piece of solid oak, the base widened to let aromas expand and the inside lined with a honey wax that helps bring out flavor (extra is included). Made from oak and stainless steel in China. Designed by Yossi Levin and Max Cheprack in Israel, where they work with their community on local social initiatives. 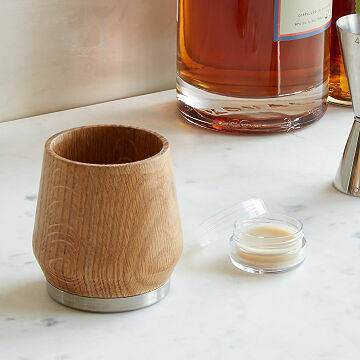 Out of Yossi Levin's background in community organizing and Max Cheprack's experience in industrial design came a business that works with craftsmen both local and abroad to create thoughtful goods, which range from handsome whiskey tumblers to sustainable cork water bottles. When they're not in the workshop cooking up new partnerships and products, Yossi is probably climbing the stairs at his mountain top home in Haifa, and Max is most likely riding his custom titanium bike across the Carmel Hills. Apply honey wax between uses. I ordered this product twice. The first one that came had a large crack in it. No amount of waxing was going to take care of that. I contacted customer service, told them of the issue It was promptly replaced, at not cost. The replacement came and even after following the waxing directions to the letter, after one use and more waxing, a similar crack formed. Actually it looked like it was broken, and it leaked at the base. I officially give up. Not worth the price, time, and effort. I love this tumbler so much!!! I use the tumbler on special occasions and weekends. I love it. I bought this whiskey tumbler for my husband for Christmas and he loved it. Unfortunately, the hairline crack turned into a larger crack after one use and it was unusable. This was a big hit with my brother-in-law! The tumblr was not of good quality! Purchased twice leaked! I hoped that this truly unique purchase would make a great gift. It was for a friend who is a whiskey connoisseur. But both items leaked with first dram of whiskey, cracks in tumblr! Great gift for a whiskey lover! Smaller than expected but great quality. No cracks in the wood at all. The gift idea you've been searching for! The design, look, and taste the tumbler delivers exponentially increases the pleasure of enjoying a scotch. It is unique, fun, and looks awesome for a whisky lover. I was so excited to see this, and my brother loved his first few sips. However, as a prior reviewer noted, he found that after the first use and diligent application of the wax, the cup would leak all over the place. Help! Nice flavor from the wax and a lovely first experience, but I can't say that I'm pleased that it is unusable after a single use.